Shifting lanes, missing signs, and poor lane lines on Interstate 95 in Massachusetts have contributed to driver confusion, close calls, and at least one crash on the southbound side just past Route 9, the NBC10 Boston Investigators found. Construction on I-95 in Wellesley and Needham is in its final major phase, according to state officials. Work has wrapped up on a new set of exits at Highland Avenue and Kendrick Street just south of Route 9. Replacement of a new bridge carrying the Interstate over Route 9 is progressing and a spokesman for the Massachusetts Department of Transportation (MassDot) said the highway’s final configuration should be in place by the summer. As that work has moved forward, highway crews have shifted the travel lanes all around in order to start on various parts of that bridge. Once one part is completed, lanes shift to free up another part. One part was completed in December, and crews moved the travel lanes toward the concrete median. All the while, the breakdown lane on both sides remained open to travel during the morning and afternoon commute times. 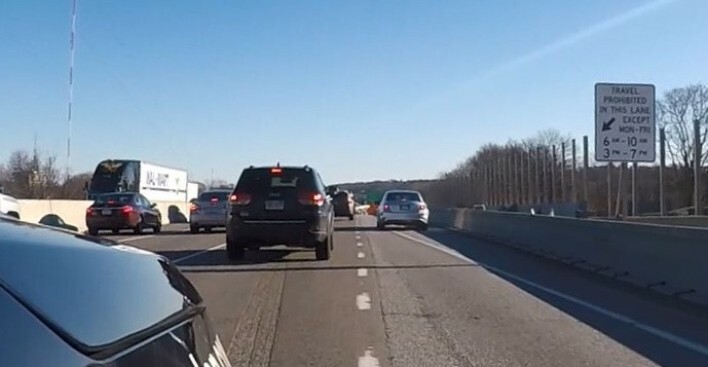 After the December shift, weather and a lack of signage combined at the Route 9 exit to create confusion for drivers, a situation marked by unclear marks on the road and no notification when, or if, the breakdown lane should be used. The NBC10 Boston Investigators attached GoPro cameras to vehicles to record traffic for numerous days. We found drivers unsure where they should be when getting on I-95 south from Route 9, whether they should be using the breakdown lane, and where and how to exit I-95 onto the new Highland Avenue and Kendrick Street exits. “People have to make split-second decisions, and it’s important that they know what they’re expected to do, and they can predict what the other drivers around them will do,” said Peter Furth, a civil engineer at Northeastern University’s Snell Engineering Center who is an expert in traffic and transit. Furth rode along with NBC10 Boston to assess the travel lane configuration and watch how traffic behaved. He noted that the white line guiding traffic off the exit and onto the Interstate was faded, and divots pocked the pavement where old lines had been ground away. The breakdown lanes on both sides of the Interstate have been used for rush hour travel for years. But after the latest lane changes, no signs noted when the breakdown lane could be used. That’s important, because Furth noted when the breakdown lane is in use, drivers exiting the Interstate should exit from the breakdown lane, not the normal right travel lane. Joe Donaruma, an NBC10 Boston employee, was sideswiped by a white van one morning. The van, he said tried to exit from I-95 south onto the Highland Avenue ramp from the right travel lane. Donaruma said he was in the breakdown lane and attempting to exit when the van collided with him. The NBC10 Boston Investigators found drivers on weekday mornings trying to exit to Highland Avenue from the travel lane and cutting in front of drivers exiting from the breakdown lane. And even though drivers were allowed to use the breakdown lane, and are supposed to exit from there, we saw drivers change back and forth and back again from the breakdown lane when getting on I-95 from Route 9. We also saw drivers in the breakdown lane during off hours, when driving in the breakdown lane was prohibited. After the NBC10 Boston Investigators started asking questions, MassDot sent workers to the Interstate to install two signs detailing when travel in the breakdown lane is permitted. Stephanie Pollack, the state Secretary of Transportation, said MassDOT maintains close oversight of contractors to make sure the roads and signs are clear during construction, but was inhibited from striping the Interstate because of cold and snow. “Our goal is of course always safety and helping drivers know where they need to go and we will do the best we can,” she said. MassDOT will re-stripe the area of I-95 around Route 9 when weather allows. The work around Route 9 is part of a massive $750 million add-a-lane project to I-95 south of the Massachusetts Turnpike. While some drivers said noted some confusion, others said they were used to it. “It’s Boston. It’s par for the course,” said a third driver putting gas in his car at the Gulf on I-95.